Has Panasonic fixed their not so great contrast autofocus system with the S1? Check out the video! Panasonic announced the first two Full Frame mirrorless cameras. 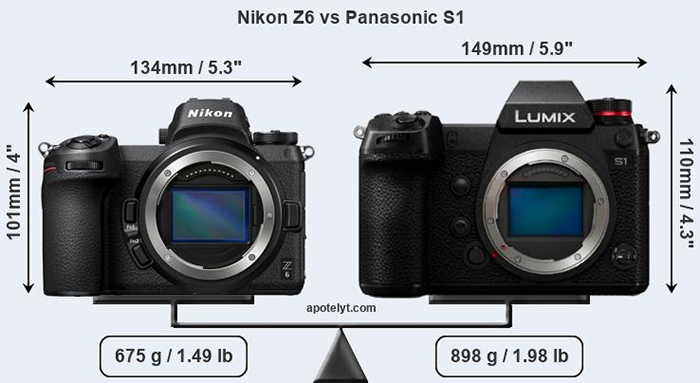 And they both compete perfectly against the Nikon Z6 and Nikon Z7. Here is a size comparison via Apotelyt. The Nikon Z 24-70mm f/4 S is a compact high-performance ultra-ultra sharp lens for Nikon’s new full-frame mirrorless cameras. It’s tiny and optically excellent, so it’s the best lens you can get for you Nikon Z now. I’d not bother with an SLR lens on the FTZ, which is going to be bigger and have lower performance. If you’re going to use a Z body, get the right lenses for it. The Nikon Z 50mm F1.8 S is a powerful standard lens for the Z system, offering outstanding sharpness and full-aperture performance. There are better 50mm lenses on the market for portraiture, but none that are sharper or so well-corrected for coma and longitudinal chromatic aberration when shot wide open. In nearly every way in both lab and real-world testing, the Nikon Z7 was competent or excelled, performing incredibly well in a wide variety of situations. The camera’s body and design are familiar yet improved in meaningful ways, while offering a much lighter and more compact body than Nikon’s full-frame DSLR cameras. The image quality is excellent, the new hybrid autofocus system is generally quick and accurate, and it’s about time IBIS was offered in a Nikon. For users demanding high-quality video, the Z7 offers that as well, plus many videographer-friendly features. However, for those wanting better video features, as well as a bit more oomph in the performance department, the Nikon Z6 is perhaps a better choice if you’re willing to drop down to 24MP stills. 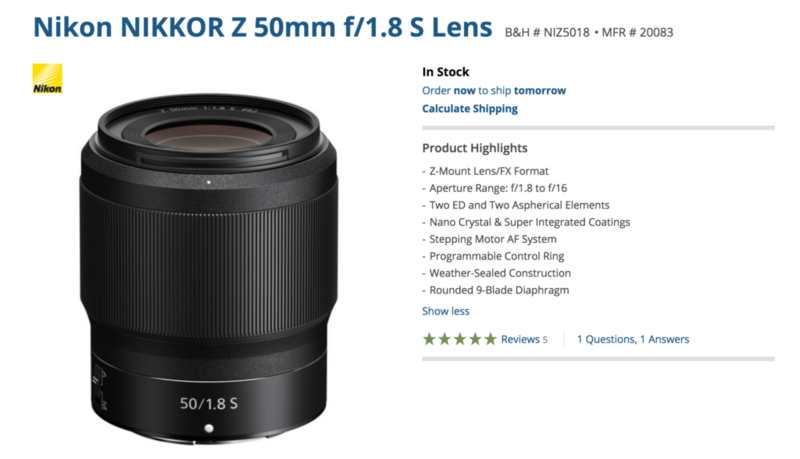 The new Z-mount lenses released so far are also quite impressive, especially the 35mm f/1.8 Sand 50mm f/1.8 S primes which are both very sharp lenses. 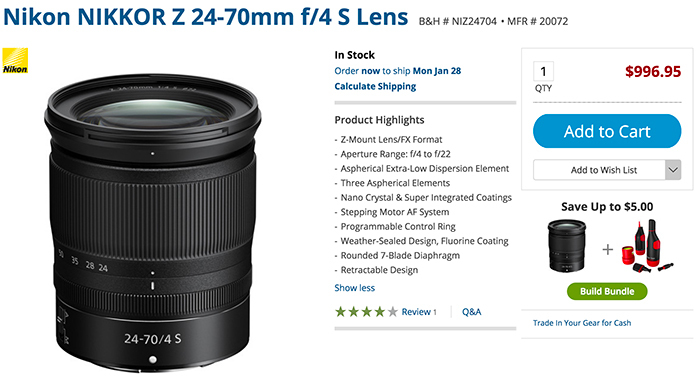 The small 24-70mm f/4 S zoom lens is a great travel lens that’s sharp and lightweight, however the lens relies a bit heavily on software corrections (likely a compromise to get size and weight down). And the just-announced 14-30mm f/4 S lens look to be an excellent optic for landscape and architectural photographers. Overall, the Z Mount has a lot of potential, and we’re excited to see what the future holds. Is the Z7 perfect? Of course not, no camera is, especially not one which is the first of a brand-new system. There are still a few kinks to be ironed out and some areas to be refined, and you can tell that some of the other players have been making mirrorless cameras longer than Nikon. Hopefully most of the foibles will be addressed with firmware updates. In fact, at this year’s CES, Nikon announced firmware updates that will add new features, such as Eye AF, to both the Z7 and Z6 cameras, so there are already updates in the works. Overall though, when taking image quality, performance, features, build quality, ergonomics and size all into account, it’s clear the Nikon Z7 is one heck of a camera, so much so that we’ve awarded it Best Pro Camera of 2018, and it’s absolutely a Dave’s Pick.